^ a b c d e f g h i j k l m Brusca, RC; Brusca, GJ (2003). Invertebrates (2nd ed ed.). Sinauer Associates, Inc.. pp. pp.793-799. ISBN 9780878930975. ^ a b Helmkampf, M et al. (2008). “Phylogenomic analyses of lophophorates (brachiopods, phoronids and bryozoans) confirm the Lophotrochozoa concept”. Proceedings of the Royal Society B: Biological Sciences 275 (1645). doi:10.1098/rspb.2008.0372. http://www.ncbi.nlm.nih.gov/pmc/articles/PMC2593926/. ^ Cavalier-Smith, T (1998). “A revised six-kingdom system of life” (PDF). Biological Reviews 73 (3): 203-266（とくにp.241を参照）. doi:10.1111/j.1469-185X.1998.tb00030.x. http://www.algaebase.org/pdf/562A099111b9e002DCkuM263F88D/Cavalier-Smith1998.pdf. ^ a b c Cohen, BL (2000). 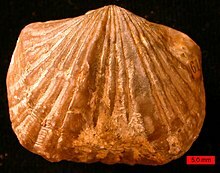 “Monophyly of brachiopods and phoronids: reconciliation of molecular evidence with Linnaean classification (the subphylum Phoroniformea nov.)”. Proceedings of the Royal Society B: Biological Sciences 267 (1440): 225-231. doi:10.1098/rspb.2000.0991. ^ Dunn, CW et al. (2008). “Broad phylogenomic sampling improves resolution of the animal tree of life”. Nature 452: 745-749. doi:10.1038/nature06614. ^ Popov, LE et al. (1993). “Phylogenetic analysis of higher taxa of Brachiopoda”. Lethaia 26 (1): 1-5. doi:10.1111/j.1502-3931.1993.tb01502.x.